What are the books you recommend? The Aurora HO SLOT CAR IDENTIFICATION and PRICE GUIDEby John A. Clark has great color photos of all the Vibrators, T-jets, AFX and is great for identifying the Aurora cars. If you want to collect Aurora and need an invaluable indentification guide, this is the one you need. The photos are large and almost to even scale. It has some pricing on each car. Approx 7.5" x 10", 137 pgs., (c) 1995. The HO SLOT CAR and Accessories VALUE GUIDE #4 by Howard Johansen lists every known H.O. slot car made with every known color combination AND a price for EACH car! This is the HO slot collector's "Bible". This is a massive 8.5" x 11" book with 198 pages of listings and the average page has nearly 100 different car combination/price listings! An HO slot collector wouldn't be caught without this book in their library. NO PHOTOS (c) 1997. (SAMPLE Photo shown only shows partial of the text page). 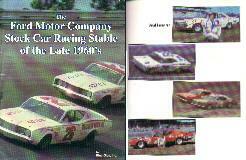 The Ford Motor Company Stock Car Racing Stable of the Late 60'sby Blue Glen, Inc. has great color photos of all the mid-60's to late 60's Stock Cars, including the Fairlanes, Torinos, Cyclones, Galaxies, and up to the super-fast Talledegas. If you like custom painting your HO slot cars to look like the original cars this is a great reference book. I have found this book a great source for referencing paint schemes on my cars. 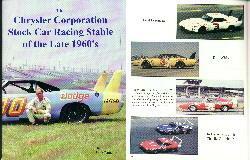 The Chrysler Corporation Stock Car Racing Stable of the Late 60'sby SportGame, Inc. has great color photos of all the mid-60's to late 60's Stock Cars, including the Belvideres, fastback Chargers, Roadrunners, and up to the super-fast winged cars like the Superbird and Daytona. If you like custom painting your HO slot cars to look like the original cars this is a great reference book. Just another great reference book for those that like to paint and decal their cars. The Complete Color Guide to AURORA H.O. SLOT CARS 1st edition by Bob Beers has crisp photos of every AURORA & AFX slot cars in ALL color combinations. Everytime you turn the page, there is a large full-page color photo with about 30+ cars along with a description page giving Aurora Part #s, color combinations, chassis types, years made and rarity rating on EACH car Aurora made! Photos and listings from Playcraft, Vibes, T-jets, to AFX's, G+, etc. to even protoypes, advertising literature and set artwork. If you like Aurora slot cars, you'll not put this book down for days. . I hope this helps with your questions about certain books and if you need to find parts for restoring your cars, see Road Race Replicas for all your needs.